Bifolding Doors have taken a back seat for most property owners who want a sleek, contemporary feel to their home. Depending on where the doors are to be situated, the latest trends are UltraSlim double glazed or tempered frameless glass doors. These doors work on the slide and turn system. Unlike bifolds, there are no side hinges between panels therefore side frames are virtually redundant. In our gallery, there are photographs of magnificent homes with a long run of fully opening glass doors. At the other end of the scale, if you need more space in a small house, these are the doors for you! And, sometimes, it’s not the rain that’s the problem, it’s those blustery side winds. 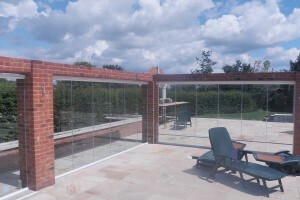 Whether you have a large patio or small courtyard, have you considered a glass enclosure? 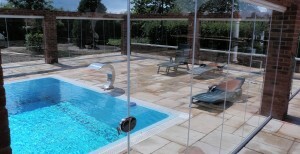 Here is a photograph of an enclosure around a pool, extending its use by a couple of months at either end of the summer. 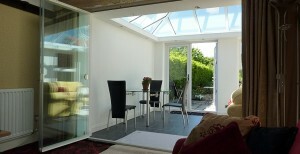 SunSeeker UltraSlim™ are suitable for most properties* where you would use bi folding doors, sliding patio doors, etc.. This may be across the back of the house, to the garden or balcony, or to a conservatory. The glazing units comply with British and European standards for thermal insulation and the doors have undergone severe weather testing. The side frames are less than 2cm in width, and are included for aesthetic reasons only, to cover the thermal edges of the double glazed glass panel*. Aluminium frames are available in three standard colour options or you may choose any RAL colour for an additional cost – see these and other optional extras for UltraSlim doors. We have been installing UltraSlim doors in the UK since 2010; they have been our most popular doors for the past few years. Visit our gallery. 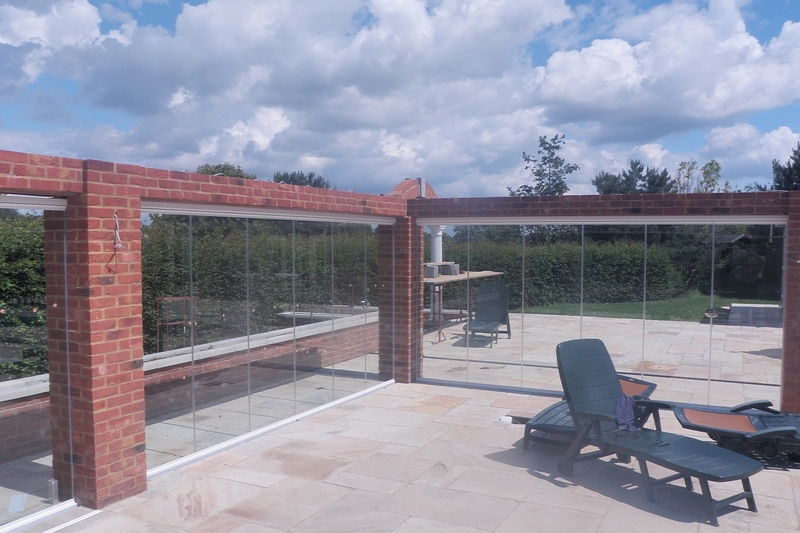 Our standard Frameless Glass Doors are single glazed tempered glass which does not have the thermal qualities of double glazing, therefore they are unsuitable as doors for external walls of domestic dwellings. They can be used internally as room dividers, externally in outbuildings or on conservatories and enclosures, and in commercial property as area partitions or enclosures. UltraSlim and Frameless Glass Doors bring you the option of being enclosed from the wind and rain or having unrestricted access between indoors and outdoors. Click for a free quotation, now.